Canine Perspective’s basic dog obedience training covers the two absolutely essential commands: Heel and Come. Heel teaches your dog to follow your moves and your direction – not the other way around! If you take one step, your dog takes one step. If you take three steps, your dog takes three steps. This level of focus is required out in the real world in our busy Chicago streets. Not to forget, your dog will automatically sit when you stop. All this is done in complete silence and without the need for treats, so there’s no need in carrying around food in your pockets anymore. Come is the most important dog obedience command for your dog to know. Why? Because it can save your dog’s life! Running toward the street? No problem! Calling your dog away from his/her friends at the dog park? No problem! Everyone practicing their dog obedience training Down/Stay command for a photo op during group class. Chasing after a squirrel? No problem! Your dog will respond to your command no matter the situation! I also incorporate an implied Stay command so your pooch will not leave your side to try and rejoin their friends and play after being called. The basic obedience training program includes six private in-home lessons over 6 weeks. 5-Star Facebook Review by Grace W.
This program takes your canine counterpart’s obedience training to the next level by adding duration work. Want to take your dog out to a restaurant with a patio, but don’t like having to keep pulling them back to your side? Have you ever run into a friend of yours in the street and stopped to have a conversation, only to have your dog randomly pull you in order to greet another dog? 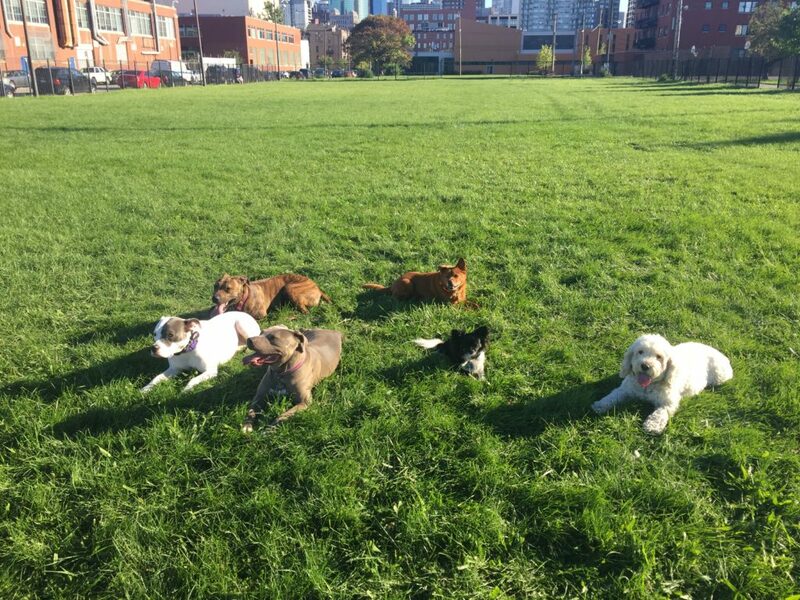 Addressing those issues is no problem in the intermediate obedience training program, where we incorporate a Sit/Stay command and a Down/Stay command so that you can go to a patio for hours. Once they’ve mastered those commands, your dog won’t move. The intermediate obedience training program includes nine in-home lessons over 9 weeks. Do you want total and complete control over your dog in any situation? Then this is the training package for you. It covers the Heel, Come, Sit, Stay and Place commands. This program will make your dog obedient both on- and off-leash, no matter the environment, and no matter the distractions! The off-leash obedience training program includes twelve in-home lessons over 12 weeks.